Now that Django support is available, there are some niceties being added to make life more pleasant when dealing with files with the same name, which are very common when developing with Django (or any other application in the case of __init__.py). 1. 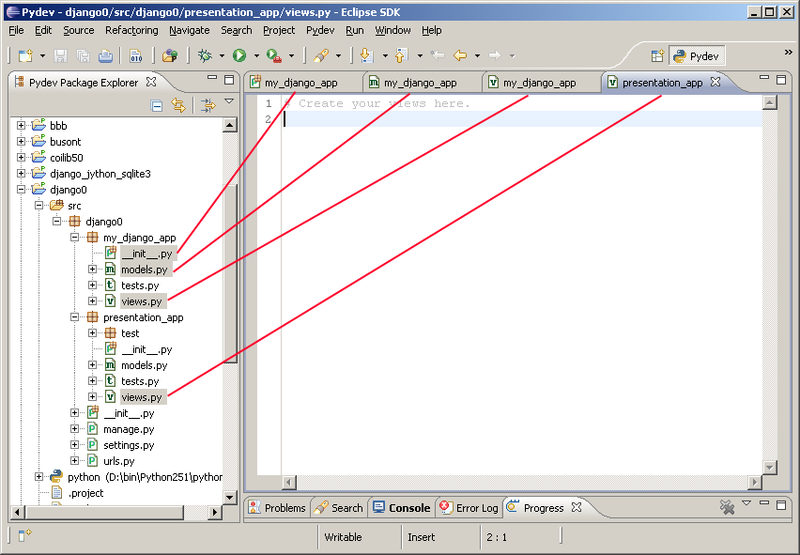 Really common files (__init__.py or in Django projects models.py, tests.py and views.py) have a special option in which the title of the editor is no longer the file name, but the name of the package containing that file, while a different icon is shown for those files (as the image below shows). 2. If there are 2 files that would be shown with the same name, PyDev will change the title of both to contain not only the name of the file, but also the name of the parent package. And with the icon available you already know it's Python right? -- So, there's an option to hide the file extensions from the tab title. Those features are already available in the current nightly build (and will be available in the 1.5.7 release). Please report that as a bug, following the steps at: http://pydev.org/faq.html#how_do_i_report_a_bug (note that there's a session about how to get the stack traces, which need to be added to the bug to have a halting bug resolved). I would have liked the option to have the normal icon but with "(appname) views.py", it would produce longer names for sure, but on my 24" and the fact I seldom have that many editors open at the same time this would have been great!. Greatest improvement in century! I have tried to push such a change for Eclipse for this specific reason for a long (though my idea was to show the upmost directory behind the file in tab). Now if someone goes to improve the tabs even more (like different color for different projects). E.g. I have many projects open and all the files get mixed in the tab list because they are randomly ordered and in same color. Going through package/file explorer is very slow process. This is a huge help! i always got lost when working with multiple django apps; no more!